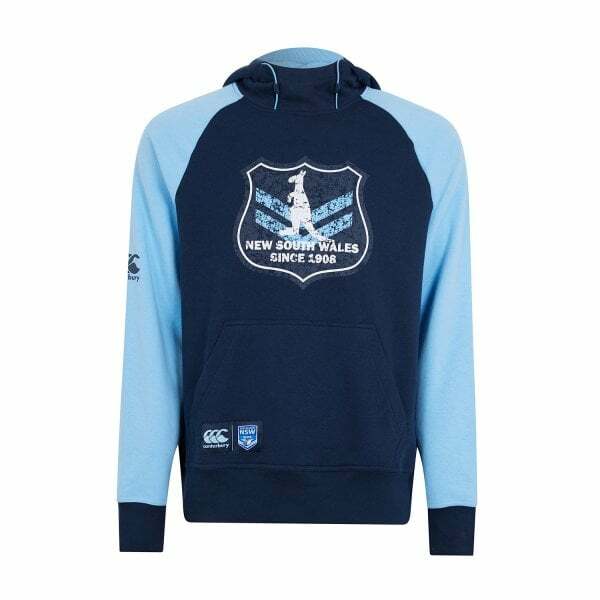 Our Vintage Shield Hoody will not only keep you warm at the game, it’ll show your support for the mighty Blues, with its vintage shield on the chest proudly displaying the NSW Origin story. Canterbury’s Vintage Shield Hoody is designed to do two things. Its primary function is to keep you warm at the game, thanks to its 300gsm polyester and cotton brushed back fleece construction and its lined hood and kangaroo pockets. But its other purpose is to tell the story of NSW in State of Origin. The strength of the Blues is symbolised by a washed back retro style print on the chest, picturing a kangaroo on the NSW 1908-2008 Centenary Shield. This is a unique garment that you’ll wear constantly not just to stay warm, but also to show everyone you’re a proud NSW Blues supporter.